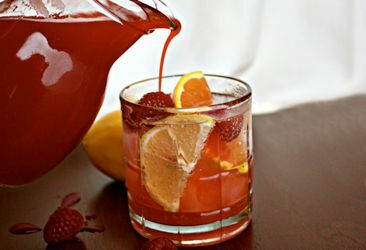 This simple blend of fruit, natural sweeteners, tea, and seltzer water is an ideal afternoon or evening drink for a casual gathering with friends or an afternoon surprise during the workweek. Bring the water to a boil in a saucepan and drop in the raspberries. Lower heat and simmer for 3 minutes. Remove from heat and sprinkle the tea into the pan. Cover and let steep for 2 minutes. Strain the warm liquid through a fine mesh strainer into a small saucepan using the back of a large spoon to break up the pulp of the berries and push the liquid through. Add the honey, stir for about 2 minutes, then chill in the refrigerator. Pour 1 tablespoon of the chilled raspberry syrup and 1 cup of cold seltzer water into each glass. Stir, add ice and serve immediately.